Earlier this year the Humane Society of Canada launched their Rescue Me project to "combat the greatest preventable inflicted upon dogs and cats which is pet overpopulation." However, rabbits weren't mentioned, even though they are put down all across this country simply because there aren't enough good homes for them. Just like dogs and cats, thousands upon thousands are abandoned by their "owners" for any number of reasons. Excuses range from moving, allergies, not enough time, or s/he didn't live up to expectations. The Rabbit Advocacy Group of BC contacted the Society and after several conversations and e-mails the matter was looked into and remedied. We will continue to be a voice for rabbits and campaign on their behalf. Rabbits can start having babies anywhere from three to six months of age, and females can become pregnant within days of having a litter. 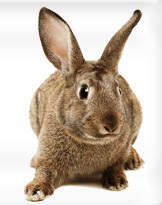 Theoretically, two rabbits and their offspring can produce 8,388,608 kits in a seven-year period. The death of each animal shifts the blame away from irresponsible pet owners and on to the shoulders of humane societies who must bear the moral, ethical and practical burdens of coping with this problem.